Home Article One Cool Kid. One lovely thing about winter holidays is that my Hubby D and I get to visit almost everyday, via Iphone, with my girls and with my grand-daughter. That makes my day, no two ways about it. Today as I was visiting, my grand-daughter and I realized that we both got Penguins for Christmas!! She got two and I got two. 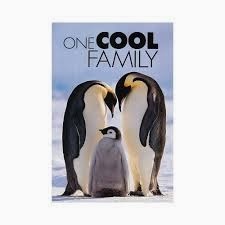 One of mine has a baby at it's feet just like the poster that reads "One cool family". So, we got talking about penguins. I showed her what I was making for my penguins. I plan to post some more about this tomorrow. We talked about the South Pole and the ice and cold. She wanted a snow cave for her penguins too, but then we got talking about different ways we could make ice for them to play on. Her Mama plans to freeze some water to make real ice.....fun, fun, fun. And then I reminded her of how when I visit with her she often wants to go skating with me. She puts a square of fabric on the floor, she calls it her "ice piece" and places one foot on the fabric, along with the Iphone, and the other foot on the floor and we skate along together. Just then the Iphone ran out of battery and needed to be plugged in. The plug is right by the coffee table, so she brought her penquins there along with a gold mardi gras necklace. She propped up the Iphone on the puzzle box, and all of a sudden the penquins skated by. Back and forth they went. Why Less could be More? This Daddy, a Super Hero!